Balance is the key. The authors describe ways to analyze your current energy expenditure and finding out what impactful changes you can make to optimize your daily enjoyment of life. For example, in North America, many people overspend their intellectual energy – solving problems at work and so on. Meanwhile, they spend too little physical energy, causing lethargy and sickness. They make up for this by artificially boosting their energies with caffeine, sugar, adrenaline, sheer willpower, etc. This will only further erode their base of physical energy, as they never fully learn to disengage and replenish that energy. Furthermore, many people often completely neglect to train their emotional energy – chatting with friends, seeing family, making love, etc. – nor do they train their spiritual energy – praying, seeking meaning, helping others, and so on. The book includes countless methods on how to train each energy. 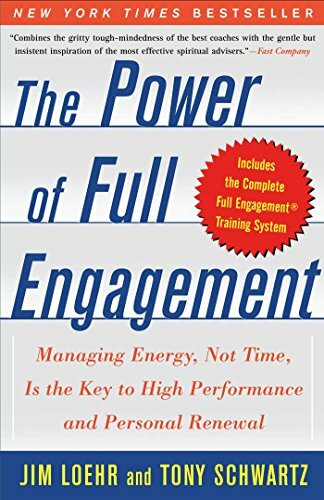 It reads like a manual for how to optimize your engagement with, and enjoyment of, life. It’s extremely fun to read, peppered with examples from history’s greatest men and women.